We are engaged in offer Extruded Rubber Profiles to our clients. We offer these in various shapes and sizes as per the choice and requirements of our customers. 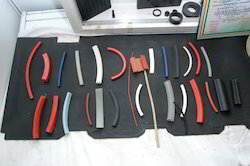 We can customize our range of rubber molded and extrusion components as per the client requirement. Our Industrial Rubber Extruded are made using a hot vulcanization process.